For anyone that suffers from back problems the promise of a supportive and comfortable bed at night can bring welcome relief. Eight out of ten people suffer from back problems at some time in their lives and many now choose to buy an orthopaedic bed for this very reason. Designed to softly surround the body to ensure that aches and pains are reduced, back supporting beds can help reduce pressure point build-up experienced when sleeping. Of course, not all people choose an orthopaedic bed because of back pain. Many chose this type of bed because it offers luxurious comfort with firm support. Choosing which type of bed is right for you is a big decision, and given that we spend a third of our lives sleeping, buying a new bed is a major investment. A bigger bed will be of benefit both for the back pain sufferer and for their partner. Zip and link beds are a good option if firmness preferences differ widely or where a future requirement for two separate beds is identified. Open Coil springs are the most commonly used spring system on the market today and ideal if you are looking an inexpensive bed with firmer support. Respa’s collection of orthopaedic beds is a great example as they provide edge-to-edge support using its renowned open coil spring system and Respatech technology. Complete with density and gauge ratings so that you choose which tension suits your individual needs. The 4'6" Respa Posturecare Divan Bed is part of the Respa Healthcare Collection. This highly supportive Orthopaedic Bed provides edge-to-edge support using Respa's renowned open coil spring system and layers of high quality fabrics in its mattress. Pocket sprung orthopaedic beds are of a higher quality with each spring pocketed within a fabric casing allowing them to function independently of one another. Responding to how your body moves while you sleep, Kaymed, King Koil and the Natural Sleep Company are perfect examples of tried and tested traditional pocket sprung orthopaedic beds. 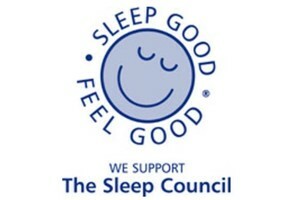 Also providing pressure relieving qualities are memory foam orthopaedic beds. An increasingly popular choice, these beds can offer the firmness you require, with cushion comforting softness to prevent pressure point build-up. Spring Air by Briody’s collection combines Comfort Lok Coil, which provides additional innerspring support for the lumbar area, with a SMT Base Pad, specially designed ultra-premium upholstery support material. The Spring Air by Briody SleepSense Natural 4' 6" Divan Bed combines COMFORT LOK Coil found in all SleepSense products, which provides additional innerspring support for the lumbar area, with a SMT Base Pad and Eco Divan Base. The Spring Air SleepSense Natural 4' 6" Divan Bed incorporates natural upholstery layers with a luxurious deep tufted finish in its Non Turn Mattress. Providing the ultimate back supporting springs, the Briody SleepSense Natural 4' 6" Divan Bed comes with a colour matching base with a chrome leg option. To truly appreciate the quality and range of orthopaedic double beds we have available, visit us at Dalzell’s at our showroom in Markethill or view the collection on our ecommerce site armaghbeds.com. With the added reassurance of Free Pillows and our Free Delivery Service throughout Northern Ireland and Counties Dublin, Louth & Monaghan, you won’t be disappointed. What’s more, we’ll Recycle your old bed and Remove and Dispose of Packaging, and set up your new divan bed and mattress in a room of your choice. Delivery is also available at competitive rates throughout the rest of Ireland. With additional discounts for Multibuy, and our Price Promise, you can be sure you're getting a great deal because we appreciate your business! For expert advice on all orthopaedic divan beds call, email or visit in-store today.